For Cinco de Mayo, I made a picadillo featuring ground pork and chipotle peppers. Turned out well, but on the second go-round I learned from my initial try and rocked it. 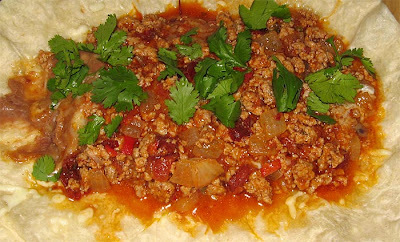 Picadillo means "mince" and so I liberally use it to describe my minced-ground pork dish here - typical picadillo's you'll find in Mexico won't resemble this. They might not be as tasty either. In some olive oil, I sauteed some onions and then garlic. Then goes in the ground pork, turned over till browned. Then add in tomatoes, chopped chipotle peppers and their canning sauce (assuming you go canned chipotle, hard to find otherwise), along with salt and black pepper. I added some chopped serrano chile for good measure - nice heat kick. Chipotles are hot enough for most people. Cover all this with water. Simmer for a half hour roughly. Here comes the good part: remove the meat, and then boil down the remaining sauce until most of the water has evaporated. At this point, you'll be left with mostly liquid fat and sauce. What's left should be sweet, tangy, spicy. Return the meat to the pot, coat with the reduction, and serve. Pictured below in a burrito.